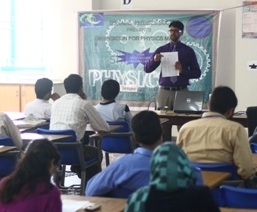 The Physics Department and Benade Physics Society organized an orientation for students majoring in Physics on Thursday 27 March 2014. Faculty members and students from the Physics department participated in this orientation. Dr Fareeha, Chairperson Physics Department, introduced faculty members and career opportunities available to students. Prof M Nawaz, Chief Proctor, highlighted the life and services of Prof JM Benade who was one of the longest serving professors in the department and retired as its head in 1970. Students were given departmental road-map, list of career opportunities and scholarships provided to students. 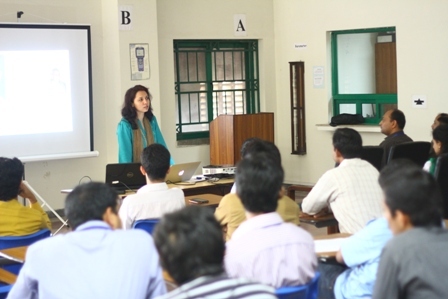 A presentation was given on the role of women in Physics and Optics by female students. This orientation provided great help for students to understand Physics core courses, comprehensive exam, research project or research thesis and about career opportunities after doing physics major. In the end the students were given a tour of the lab. They visited Optics, Electronics, Nanotechnology and Modern Physics Lab. Students really got fascinated from lab tour and asked different questions regarding the apparatus and experiments. The Physics Department also celebrated the 150th Anniversary of FCC. 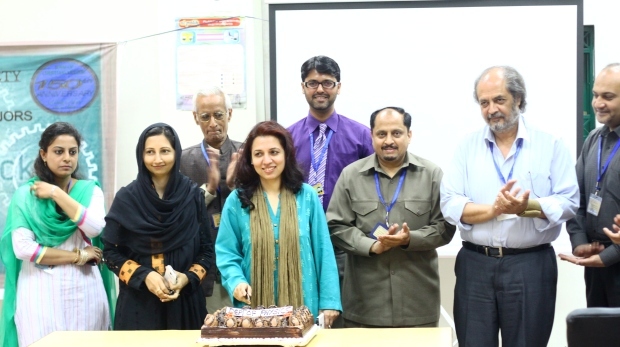 Dr Fareeha Hameed, Dr Monas Shahzad, Advisor of Benade Physics Society , and other faculty members cut the cake.